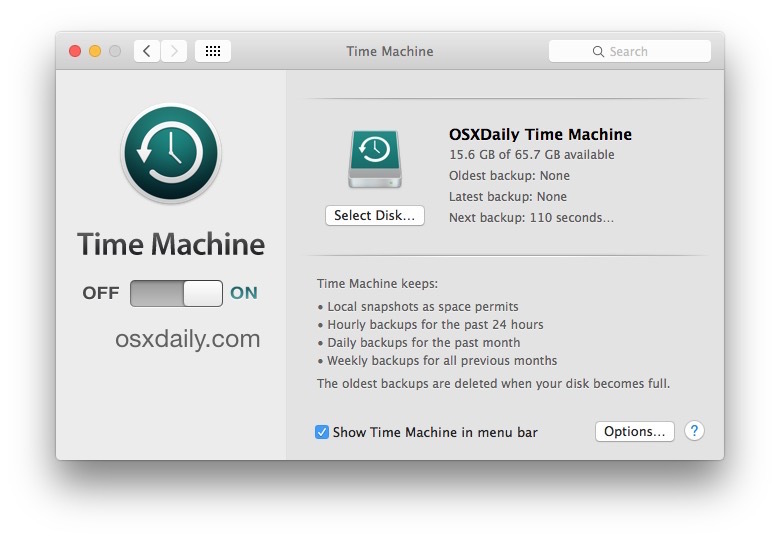 Time Machine is an easy Mac backup solution built into OS X that allows for automated continual backups of files, apps, and the operating system itself. Not only does Time Machine make it incredibly easy to maintain frequent automatic backups of a Mac, it also makes it equally simple to restore from a backup in the event something goes wrong, whether you need to restore files, or even if you need to restore the entire Mac OS X installation. Because backing up is an essential part of general Mac system maintenance, you should always have a backup solution active. 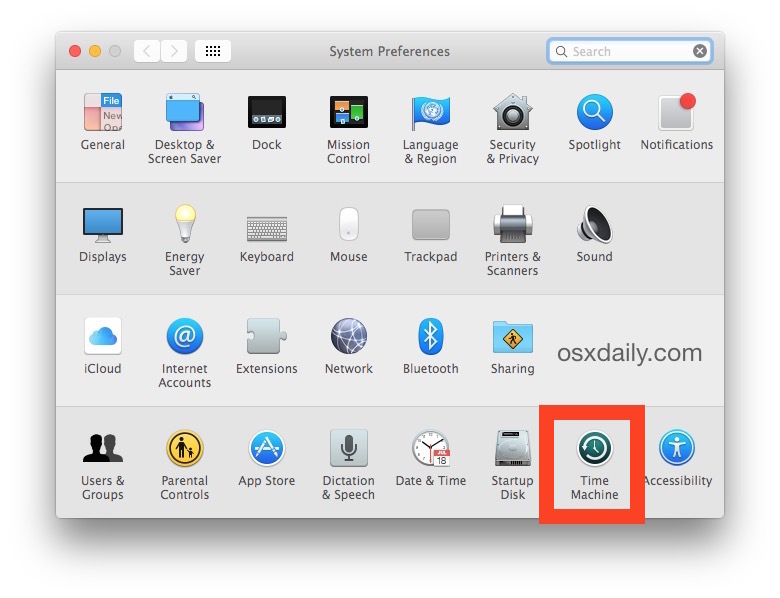 Since many users don’t, we’ll walk through how to setup Time Machine so that it will make regular backups of a Mac. You’ll want to be sure the external hard drive in use for Time Machine backups is at least the same size as the internal hard drive on the Mac, but preferably much larger. For example, if you have a 512GB internal drive, a 5TB external drive for Time Machine would allow for many complete backups of that Mac drive from different time points, which is when Time Machine backups work best (this allows you to roll back the entire Mac to different points in time, hence the name of the software feature). Note you can also partition a single drive for dual use as Time Machine and file storage, though in this article we’re going to assume you’re using a single hard drive entirely for Time Machine backups. The very first time you run Time Machine can take quite a while to backup the entire Mac, because it’s literally copying every single file, folder, and application from the Mac to the Time Machine volume as a complete backup. Everything on the Mac will be backed up by default, which is generally recommended and desired. 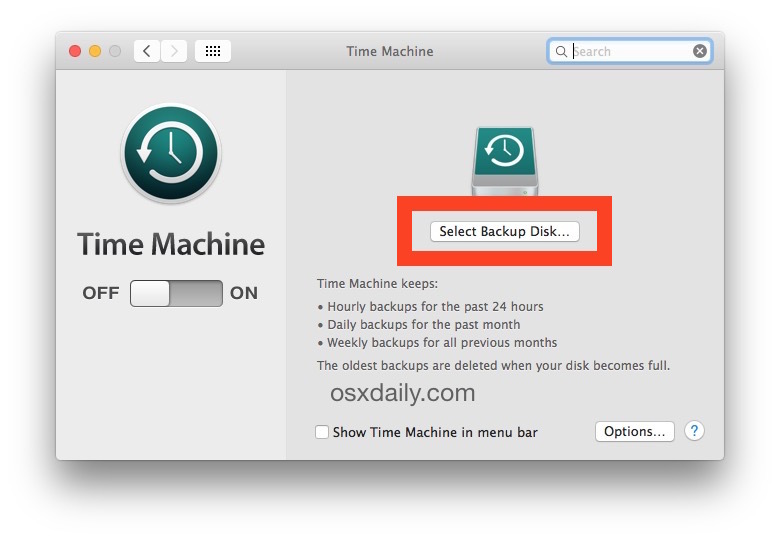 If you have a temporary folder, or some other directory or folders or files you do not want to be backed up, you can exclude any file or folder from Time Machine backups with these instructions. Now that Time Machine is setup, backups will occur automatically in the background on the Mac, as long as the external Time Machine hard drive is connected to the Mac. You can pause or stop backups at any time as well, but it’s recommended to let them continue and backup often. Another very useful feature of having Time Machine setup and configured is that you can start a backup manually at any time, which is perfect to complete before installing a new system software update, or modifying any system file or folder. 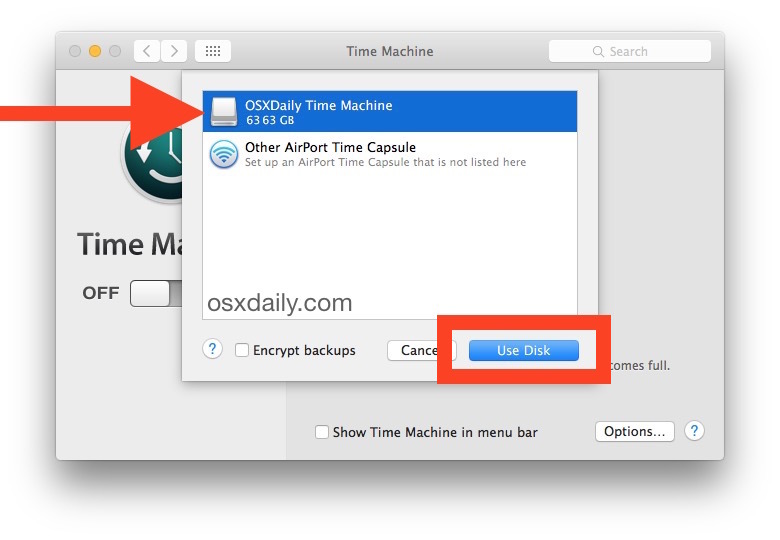 For security-minded Mac users looking to secure their Time Machine backups, you can enable backup encryption easily in Time Machine as well. This is recommended particularly if you travel with a Time Machine backup drive, or if you use FileVault disk encryption as a security measure in OS X.
Redundancy and multiple backups are also possible and easy to setup with Time Machine, though it requires multiple dedicated hard drives to do so, users can learn to setup redundant Time Machine backups here if desired.